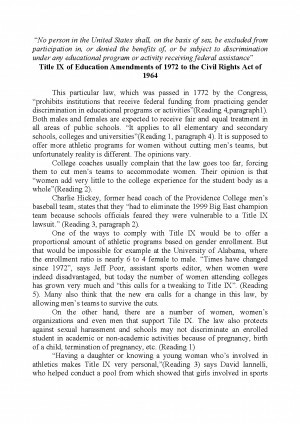 This particular law, which was passed in 1772 by the Congress, "prohibits institutions that receive federal funding from practicing gender discrimination in educational programs or activities"(Reading 4,paragraph1). Both males and females are expected to receive fair and equal treatment in all areas of public schools. "It applies to all elementary and secondary schools, colleges and universities"(Reading 1, paragraph 4). It is supposed to offer more athletic programs for women without cutting men's teams, but unfortunately reality is different. The opinions vary. 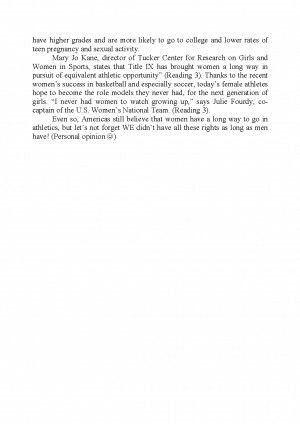 College coaches usually complain that the law goes too far, forcing them to cut men's teams to accommodate women. Their opinion is that "women add very little to the college experience for the student body as a whole"(Reading 2). Charlie Hickey, former head coach of the Providence College men's baseball team, states that they "had to eliminate the 1999 Big East champion team because schools officials feared they were vulnerable to a Title IX lawsuit." (Reading 3, paragraph 2). Descărcarea referatului cu titlul "Title IX" este gratuită. Completezi informațiile din formularul de comandă și imediat după aceea vei primi prin email link-ul de descărcare.